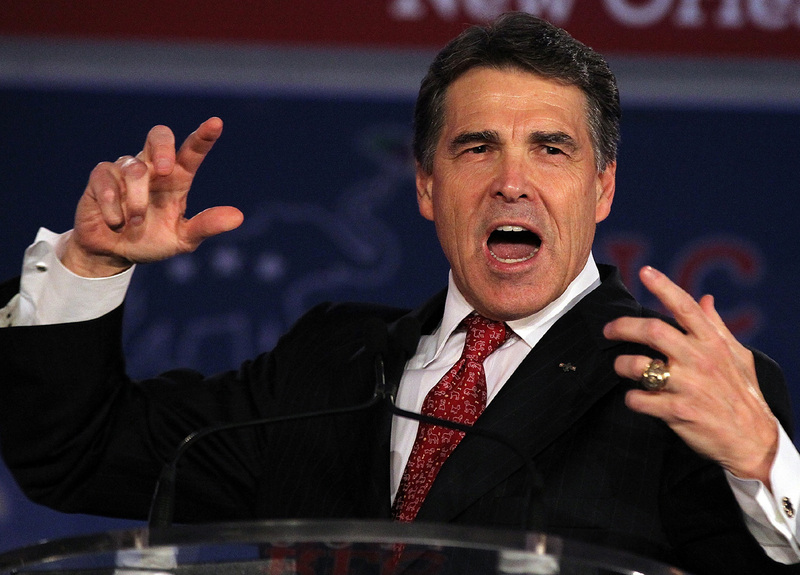 Rick Perry: Republicans should "stop apologizing"
NEW ORLEANS - Texas Republican Gov. Rick Perry - a highly-buzzed-about potential GOP presidential candidate - said at the Republican Leadership Conference Saturday that Republicans should "stop apologizing" for taking conservative positions on social and fiscal issues. "It saddens me when sometimes my fellow Republicans duck and cover in the face of pressure from the left," said Perry, referencing calls for a "truce" on social issues. He added: "Our party cannot be all things to all people." "Our opponents on the left are never going to like us, so let's quit trying to curry favor with them," continued Perry. He called on the party activists present to "stand up" and "speak with pride about our morals and our values ... let's stop this American downward spiral." Perry, who is openly considering entering the 2012 race, was greeted enthusiastically by conference-goers, who applauded wildly for his criticisms of what he called the Obama administration's "mix of arrogance and audacity," which he deemed an "affront to every freedom-loving American." Criticizing the administration for what he cast as excessive regulation and big-government overreach, Perry said of the administration, "they clearly think that they know best. And let me tell you, I vehemently disagree. They don't know best." Perry assailed the administration for "too much spending, too much interfering, and too much apologizing." Making a sarcastic talking motion with his hand, Perry said "this administration may get up and mouth words about job creation, but they clearly consider enterprise a dirty word." The speech was carefully choreographed: When the Texas governor complained of the "runaway train known as Obamacare," the sound of a train was piped through the ballroom speakers. Perry, who described himself as a "disciplined, conservative Texan," complained of an "entitlement culture in our nation." He pointed to the fact that Texas has balanced its budget and leads the nation in exports, saying such accomplishments result when people are "willing to take a beating from the liberal left and their friends in the media." Perry got perhaps his most enthusiastic applause when he called for the elimination of frivolous lawsuits; pointed to a Texas law that requires women seeking abortions to be given sonograms; and discussed his state's passage of a law requiring voters to show identification cards at the polls. Voting, he said, "is precious to us, and don't you think it's fair to apply at least the same standard required to get a library card or to board an airplane?" Perry held a book signing before his speech, and was rumored to be hosting a $1,000-per-person fundraiser for the Louisiana GOP immediately afterward. While he did not participate in the straw poll held earlier here today, conference-goers said they would be happy if he jumps in the race. "Rick Perry always fires me up," one woman said as she left the ballroom after the speech. "He's awesome. He's got my vote." Buddy Roemer decries special interest "tyranny"
Did Michele Bachmann "raise" 23 foster kids?"